This 68 page book has six chapters and covers everything from the printmaking processes, printing equipment, stencil types, photo mechanical processes, to the mounting, matting and hanging the finished print. 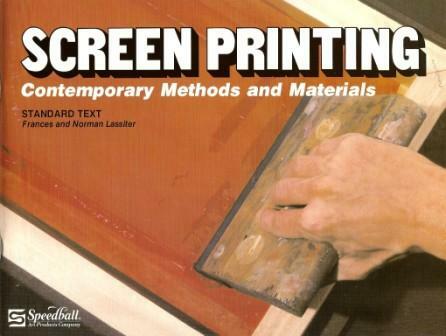 "As one of the pioneers in the development of new technology for Screen Printing, we recognize a long standing need for a standard text on this subject that would completely and objectively cover the various stencil techniques in light of the most recent technological advances in materials and procedures - from cut paper stencil to halftone stencils including photo/posterization. A standard text that could be understandable, instructional and motivational to the novice as well as relevant, informative and insightful to the skilled professional."